Fossil Free Mac (FFM), seeking student feedback and support before the board of trustees debates their proposal in May, hosted a town hall on April 1 in the John B. Davis Lecture Hall. The student organization is asking the board to place a moratorium on Macalester’s private partnerships with oil and gas companies. After classes Monday afternoon, approximately 30 students gathered to watch the presentation, which began with a review of the history of FFM and the changes the organization has undergone. 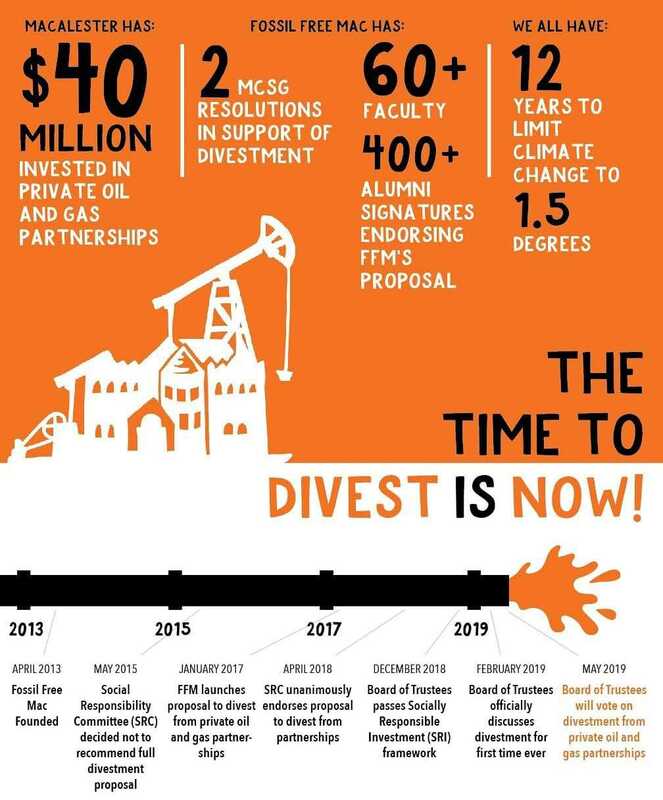 The group was founded in 2012 seeking full divestment from the Carbon Underground 200 — the top 100 oil and top 100 gas public reserve holders — which Macalester invests in via mutual funds. In 2017, they changed their ask to specifically placing a moratorium on the $40 million Macalester has in private oil and gas partnerships. Graphic courtesy of Fossil Free Mac. The board of trustees is currently debating this new proposal. While that conversation has already begun, FFM has yet to receive feedback directly from the board members. FFM responded to this and other board arguments during the town hall. Harrison added that Macalester should be at the forefront of this ethical movement. 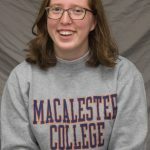 “A moral, ethical institution like Macalester College, which is renowned for its dedication to civic engagement and service to society, should not be endorsing an ethical framework that on the flip side while composting on campus, is invested in fossil fuels,” she said. “There’s an administration worry that there’s a slippery slope of divestment — that if we divest from fossil fuels, that we would have to divest from everything that anyone finds objectionable and that would overall have a bad effect on the endowment,” FFM core member Hannah Shumway ’19 said. “Our gut reaction to that is, ‘Would it be so bad to divest from bad things? No,’” Shumway began. But FFM also disagrees with this argument on a logistical basis. They point to the Macalester College Board of Trustees Guidelines for Investor Responsibility, which the board passed earlier this year. The guidelines set up both a process for groups who want to propose divestment and a system for the board to evaluate these divestment proposals. In addition to presenting their organizational goals and responding to board concerns, FFM also discussed the questions they frequently hear from students — including the concern that divestment could negatively impact financial aid at Macalester. However, based on their research on the endowment, the group is confident that financial aid will be relatively unaffected by divestment. After the presentation, the core members took further questions from the audience about their experiences with the board of trustees, the economic complexities of their proposal and Macalester investment at large. Following this gathering, FFM is also pursuing adding a student referendum to the ballot for the spring MCSG elections on April 22. The group will propose the referendum at MCSG’s April 9 meeting and the Legislative Body will vote on that proposal the following week. Should MCSG approve adding the referendum to the ballot, students will be able to vote either in favor of or against divestment. While the referendum won’t directly approve the proposed moratorium, the vote would act as a representation of student support for divestment, which FFM could share with the board of trustees for their consideration. Based on their conversations with Rosenberg, FFM believes there’s a chance they’ll be able to attend the board meeting in May to defend their proposal and answer questions. The results of the referendum would be an essential part of that presentation. And while FFM eagerly awaits the board deliberation in May, they say that even a commitment to divestment won’t be the end of the road for their organization. “We have been pretty strongly assured that we will be their main topic of conversation and we will have an answer by graduation,” Collin Dobie ’19 said. “That’s not to say that if the board does exactly what we want that Fossil Free Mac will drop off the face of the earth next year.